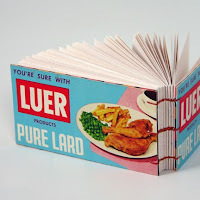 Bookbinding Etsy Street Team: LARD! because this is a word that needs to be shouted from rooftops. ... shush now, you know it does. of course, if you ask me, today's Lovely Seller (tm, probably) has a name that could be shouted from rooftops, too. SCODIOLI! her profile tells us that she is a graphic designer by day and that her dining room is now official a Craftorium. i don't know what that is, exactly, but i know that i want one. possibly i already have one. she also apparently like Mr Vonnegut, Kurt, that is, and fancy pictures of birds (but not actual birds) (^_^) and her shop tells us that she likes to make books out of things that are not normally books. the above-mentioned LARD has got to be my fav, but there's also the Valley Cream one, and her series of culinary journals. anything with MEAT on the cover in big letters can't be bad. nota bene : today also turns out to be miss scodioli's birthaday!